in 1838 as a township. Biloxi ([bəˈlʌksi]) is a city in Harrison County, Mississippi, in the United States. The 2000 census recorded the population as 50,644. 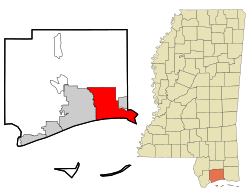 Biloxi is co–county seat with the larger city Gulfport, in the Gulfport-Biloxi, Mississippi Metropolitan Statistical Area, which is included in the Gulfport-Biloxi-Pascagoula, Mississippi Combined Statistical Area. The beachfront of Biloxi lies directly on the Mississippi Sound, with barrier islands scattered off the coast and into the Gulf of Mexico. Wikimedia Commons has media related to Biloxi, Mississippi. This page was last changed on 22 March 2018, at 21:25.